Langdon Down Centre0208 614 5100work Film/TV LocationThe Langdon Down Centre in Teddington is home to a large Victorian Theatre built in 1879 by Dr John Langdon Down. It was part of Normansfield which was a home for people with learning disabilities. The theatre is a rare and beautiful example of a late Victorian private theatre and is considered to be of great architectural and historic importance. The Theatre is also popular with filmmakers and, in the past has been used for many productions including ITV’s Downton Abbey, Endeavour, BBC4’s Pappano’s Classical Voices, The Social History of Dance, ITV film Harry Price - The Ghost Hunter and Poirot. Endeavour is a British television detective drama series and is a prequel to the long-running Inspector Morse. Set in Oxford, the series shows a young Inspector Morse beginning his career. Some locations in Richmond upon Thames double as Oxford, where the series is set. This ITV film for TV, features Rafe Spall as Harry Price, Ghost Hunter. Set in 1920s London, the story is based on Britain’s most famous real life ghost hunter and sceptic, who investigated tales of the paranormal and supernatural. 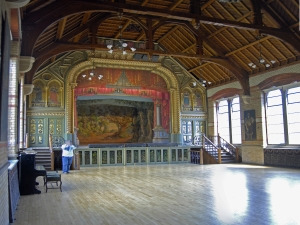 The Langdon Down Centre in Teddington is home to a large Victorian Theatre built in 1879 by Dr John Langdon Down. It was part of Normansfield which was a home for people with learning disabilities. Hercules Poirot, a fictional Belgian detective was created by Agatha Christie. He appeared in 33 novels and one play and in more than 50 short stories published. A scene from one of these dramas was filmed at the Langdon Down Centre in 2008. By train: the nearest station is Hampton Wick which is 7 minutes walk. By bus: the 281 and 285 stop outside the building. By car: from Kingston, drive past Hampton Wick station and take the first right after Normansfield Avenue into Langdon Park. From Twickenham take the first left after Holmesdale Road into Langdon Park. There is limited parking. Please obtain a parking permit from the Langdon Down Centre office.